The kind of narrative that we listen quite often by friends and colleagues during lunch conversations is how would life change dramatically if they have $1 million dollars or how life will change when they won the lottery and get $X amount of money. The focus seem to be quite centred on how this sum of money would add to their net worth. Net worth’s are a person’s equity in life. It is the difference between what you can liquidate tomorrow and the value that you can liquidate minus off the debts that you owe others. It is not that the person can purchase a $2 million dollar condo and drives a BMW, but after taking away the loans, how much is a person actually worth. The net worth to me measures how far a person have come, whether a person are building value or living in a life of risk. There are less conversations about how helpful the net worth is. I felt that the conversation or thinking should shift more to the concept of cash flow. By introducing a more functional measurement as cash flow, it helps us understand how much we need to build up to help in our lives. The $1 million you dream about or talked about is considered an asset. You can exchange it for something, or a bunch of thing that grows over time. These are considered as wealth generating assets or wealth assets for short. As wealth assets grow, the owner of the asset can be liquidated (sell) slowly the asset or in some wealth asset they generate an income on a periodic basis. This liquidation and income generated creates the cash flow. This cash flow can be very useful, how useful would depend on how a person look at it. A person with expansive knowledge can further leverage on this cash flow to produce more cash cash flow. A person in need can see this cash flow as a relieve to take care of a part of daily expenses. A very well known example is to exchange your cash to put in fixed deposit that generates interest or to purchase an investment property that can be rented out. How much cash flow do you need? 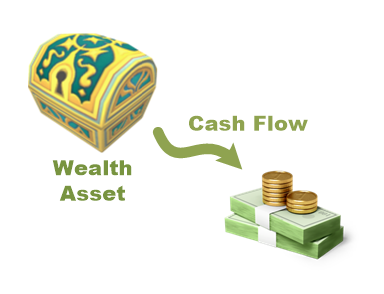 How much wealth assets do you need to generate the desired level of cash flow? Almost everyone nowadays owns a mobile phone and with your mobile phone comes a phone plan. You will need this mobile phone plan in your early retirement and financial independence as well. You need to pay this phone plan on a monthly basis depending on what kind of plan you subscribe to. On an average, people will pick a $50 per month plan. How much wealth assets does a person require to generate a small cash flow to pay for the monthly phone bill? Suppose your way of wealth building is to purchase a property and rent it out, and use the rental to provide for your mobile phone usage. I know you cannot buy a property for that little of money, but bear with me. This $20,000 generates a recurring cash flow that pays for your 1 year of phone bill. The assets that you need to generate cash flow to fund this little personal utility of yours gets reduced from $2,400 to $4,000. In this way, we have established a link between a lump sum asset and your spending. A phone bill might seem trivial, but it is a personal utility that you cannot see yourself not spending. This is even so for retirement, or if you would like to be financially independent and take an extended sabbatical. A look at the phone bill is an examination on a granular level how your spending impacts the wealth assets you require for whichever long term goals that you are thinking about. Suppose now, tell yourself that you cannot do without your car when you are in early retirement or financial independence. When we evaluate whether we should buy a car, we often think in terms of the lump sum that is required to purchase the car. For example, the down payment is a lump sum, the overall vehicle cost is a lump sum. However, it is likely that we will service the payment and loans on a monthly recurring basis. This cost will be ongoing, even after 10 years when you scrape the car. This is because you get so used to living with the car that you cannot live without it, and would look for another car and continue to pay for it. Conservatively, the all in monthly cash flow needed for a car can be $1,200 or $14,400 a year. The kind of property you need to generate a cash flow to comfortable support your car now becomes closer to the price tag of a home you could purchased. Compare to the phone bill, you will need much more assets to produce this cash flow. When you need a vehicle, it puts your timeline to reach early retirement, financial security or independence further away. You will need more time, more income from your job to build up this level of wealth assets. As we establish how our spending affects the amount of wealth assets that you require, in this case, we can add another factor to the relationship, that is the level of stress that a person requires to build up the level of wealth asset to fulfil their spending needs. 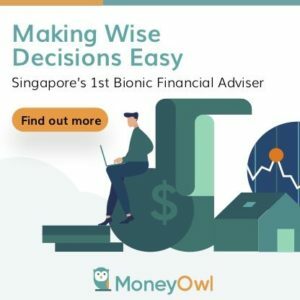 Singapore’s government annuity scheme CPF Life sought to provide a stream of never ending cash flow for retirees after the age of 65. The main purpose is to offset a single retiree subsistence. In much debate and discussion, the sum required monthly veered close to the CPF Life pay out of $1,200 per month. From the assets required to generate enough cash flow to own a car, we can have an idea how much wealth assets is required to produce $1,200 per month. The risk is borne by the annuity issuer, in this case CPF. When you are actively managing the property to generate the cash flow, you still have to do the hard work and face the risk of not able to find tenants or accepting lower rents. When you look at it from a cash flow perspective, you start seeing the CPF less as an asset that you can buy big ticket items, but more of an asset that provides a unique cash flow that pays till the holder pass away. It does not have to work alone, but as an aggregate portfolio of assets that generate cash flow with differing characteristics. Each expense you add on takes you far away from financial independence. The more things in life you see as ‘necessary’ or ‘cannot live without’, the further you get from your dream. When it is as far as $1 mil, there is a high chance you might not pursue this wealth building track at all. Why bother when you will never attain it. This exercise shows the destructive nature of not knowing truthfully what you and your family actually want. If you have a clear picture, the goal might not be $1 million. It might even be less. The opposite is also possible. Too long have we been in the dark to how much we actually need to take the foot off the work pedal. You cannot live only on a mobile phone contract, because if you can, perhaps all you need is $16,000! But this does invite you to explore the possibility to choose what you want to keep down your subsistence. An extreme person could make do with even $800 per month if he or she decides to move overseas to a lower cost area. You need $120,000 less than when you require $1,200 per month. What was a further away goal now looks much attainable. 1 form of retirement savings might be risky or inadequate to ensure you survive well in retirement. When you view them as a portfolio, you realize that your goal that is much further than you think may actually not be that far off. Unless you have a daddy that provides you with an annuity right when your mom gave birth to you, you are not going to get to where you want overnight. A graph such as this table gives you a good consolidation how your cash flow would look like over the years. When it comes to your wealth assets it gives you a step by step motivation or small wins, incentives to stick to the plan to offset more things in life so that you do not need to be so dependant on your human capital. The motivating question to post yearly is: how much monthly expenses have you covered by yourself and not your company. The conversation helps to reduce future shocks when you realize overnight that what you have planned is a mess. What are the different type of Wealth Assets that allows you to achieve this? 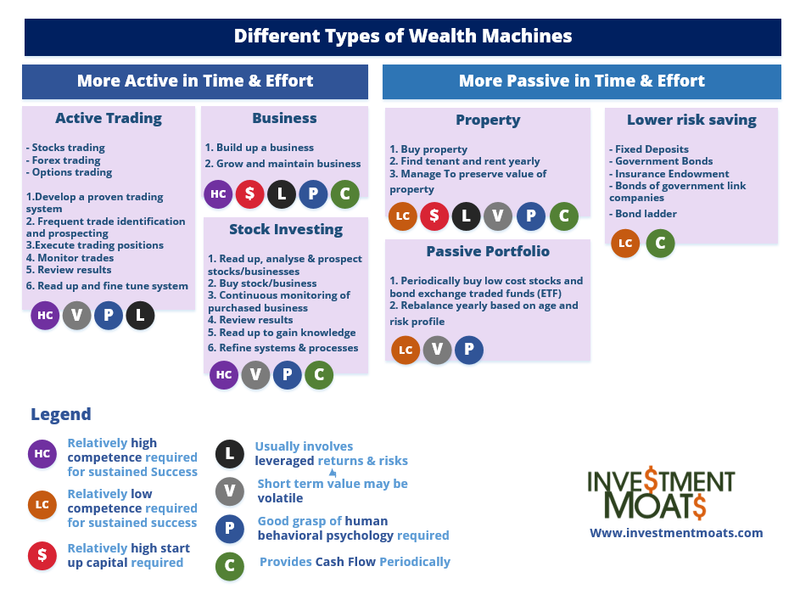 Much of the wealth building ways listed here involves exchanging your hard earned cash for assets that generates some form of income. This income could be rather fixed recurring or they could be lumpy, as in the case of trading, value investing. To a lot, cash flow and income are interchangeable terms. And they are, but the terms that we use have a profound impact on how we thinking about things, which affect our actions. Just what are the slight difference here? The goal here is to preserve the principal, that is the wealth assets that you have exchanged because they will be like a golden goose that keeps giving, provided you maintain it well. Do it well and you create a stream of income and have an asset that you can even passed on to your heirs. The common misconception is that, a portfolio of stocks and bonds unit trust or exchange traded funds, which does not distribute much dividend income, doesn’t provide a good cash flow generator. And therefore, they are often inferior. The intricate details is that the manager managing the funds can choose to distribute income or choose to reinvest their income back into their fund to make the harder work you, which is similar to a single stock which provides dividend income. The manager of the single stock can choose to reinvest their income back into their company and not pay you the dividend. The reinvestment usually means that the fund grows your wealth assets more than those ways where you choose your wealth assets that pays a higher dividend income. By looking at it from the cash flow angle, and not the income angle, you are looking to spend down not just the income BUT the principal as well. End of each year you sell off X amount of units to fund the spending for next year. You realize the equation is almost the same as wealth assets distributing more dividend income or a rental property. Of course other factors comes into the equation such as sequence of return risks, but we will leave that to another day. You will still have principal to pass on to your spouse or children but if you look at it from the cash flow perspective, you might want to enjoy more, spend more of your principal since it is your money. By using the term cash flow in the conversation, you eliminate whether the source is an ‘allowance’, or ‘income’ or ‘spending down principal’, you realize that money is fungible, and that what is more important is how much of this cash flow and how it does help you. The narrative for much wealth builders seems to be that they would like to push their wealth assets to the limits to generate as much as they can. The reality is that the considerations for wealth building and wealth distribution can be rather different. Both building and distribution requires you to evaluation your competency in your way of wealth building, the short term and long term volatility of your wealth building method as well as how long the wealth assets can generate the cash flow you require. There are no standard answers here. In the table above, I try to categorize the competency required but that will depend greatly on your willingness to spend time both upfront and on a recurring basis to be good enough to build wealth wisely, as well as the level of competency the wealth building method requires but also how easily you can comprehend such things. Volatility in cash flow might throw your plan into disarray. Most wealth building methods have their fair share of good growth and bad growth. It is easy to say you have to tackle it, but another to experience it. Finally each cash flow starts and are able to sustain at different duration. The goal here is to cover your needs. There might need to focus less on yields and returns but on overall functionality. This is as if looking at your human capital as a wealth asset, you seldom go around saying “I am not yielding well enough versus what is available out there”. There are other permutations out there. In the same sense, the permutation of cash flow parameters are the ones we mentioned, the level of active management, volatility and duration. In some cases we can transfer part of the risk away by purchasing an annuity or a deferred annuity when you are 90 years old. The idea here is that you are not putting ALL your money in it but part of it in annuity for a strategic purpose. When you shift your thinking away from a fixed asset into thinking how much, how long, how volatile your cash flow is, you might have the realisation that when you look at things differently, it might provide you with a little incentive to move forward, rather than lament the target being too far. Start by clearing your debts, then work on a simple idea of creating a cash flow to pay for your monthly phone bill. Then increase the cash flow to offset another expense. Sooner or later you realize you gotten yourself to a much better place than thinking about a target that seems so far fetch.